I was introduced to this simple, savory salad at my Knife Skills class at the Institute of Culinary Education located in Flatiron in NYC. I had always wanted to take some technique classes (rather than just learning recipes) and these two courses taught by Brendan McDermott came highly recommended. Knife Skills 1 is all about learning about the different types of knives, how to keep them sharp and handle them correctly in performing the basic cuts. We sliced up a LOT of vegetables in class 1, and while most would be going to make stock, a few were reserved for use in Knife Skills 2. In this class, we learned how to debone a raw and cooked chicken and filet a flounder. We got to enjoy a wonderful meal at the end of the class that consisted of simply seasoned oven-roasted chicken, roasted flounder, and a beautiful roasted vegetable salad. We simply took all the diced veggies and herbs from Knife Skills 1, roasted them all together with olive oil, salt and pepper and then tossed them with a leafy mesclun mix. 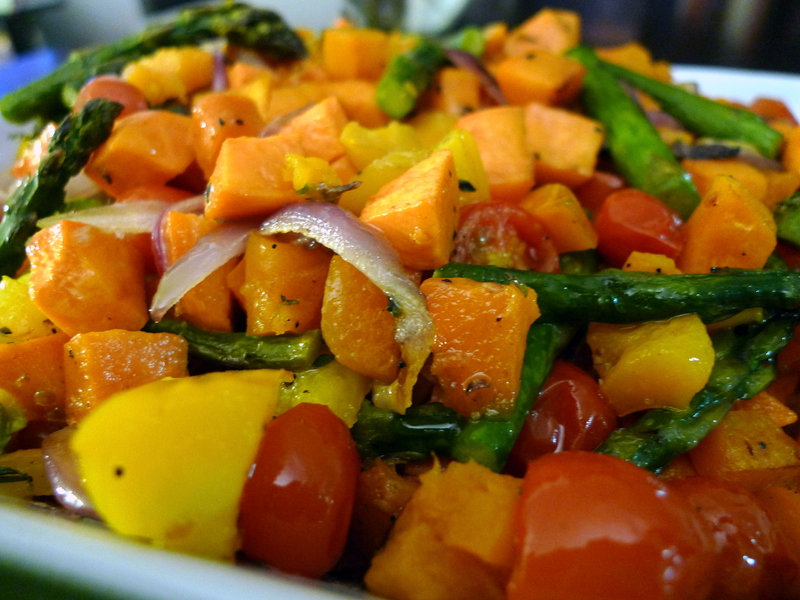 The seasoning on the roasted vegetables was all we needed to dress the salad, but a few sprinkling of fresh lemon juice really brightened up the flavors. 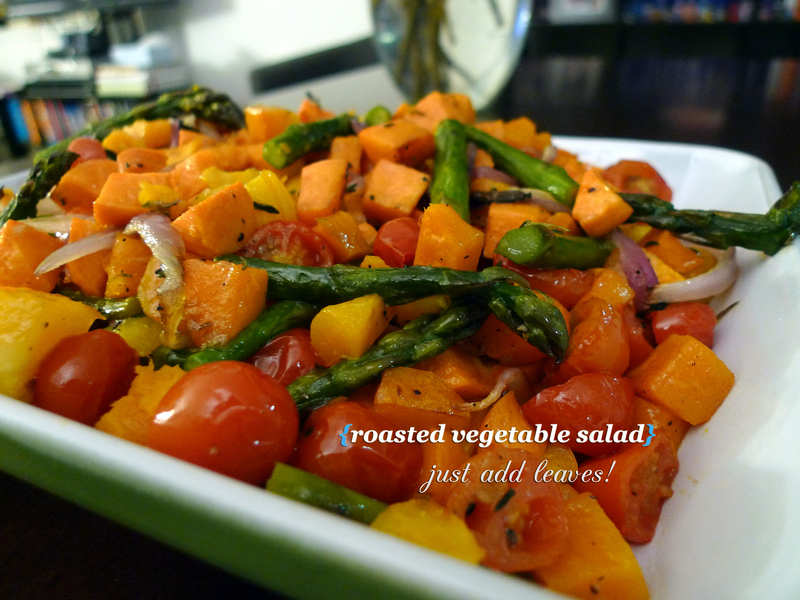 I adore roasting vegetables and while I can eat them alone, I like the refreshing addition of some light and leafy greens. We sort of eyeballed the ingredients as we like more stuff to leaf ratios so feel free to adjust as you see fit. It’s salad, not science. We served this savory salad with Buttermilk Fried Chicken and Honey Glazed Buttermilk Biscuits. In a large bowl, combine all the cut vegetables and herbs and toss with some olive oil until evenly coated and season with salt and pepper. 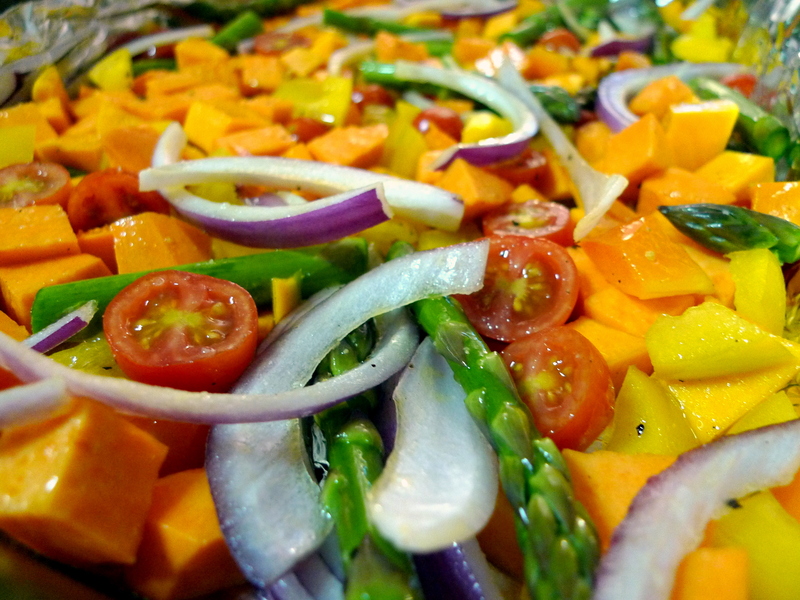 Scatter the vegetables in a single layer onto the foil-lined baking sheet and roast for 30 minutes until tender. It is okay if some of the vegetables pile on top of one another, but just make sure to give the pan a good shake every 5-10 minutes. Remove the pan and transfer the vegetables to a large bowl. 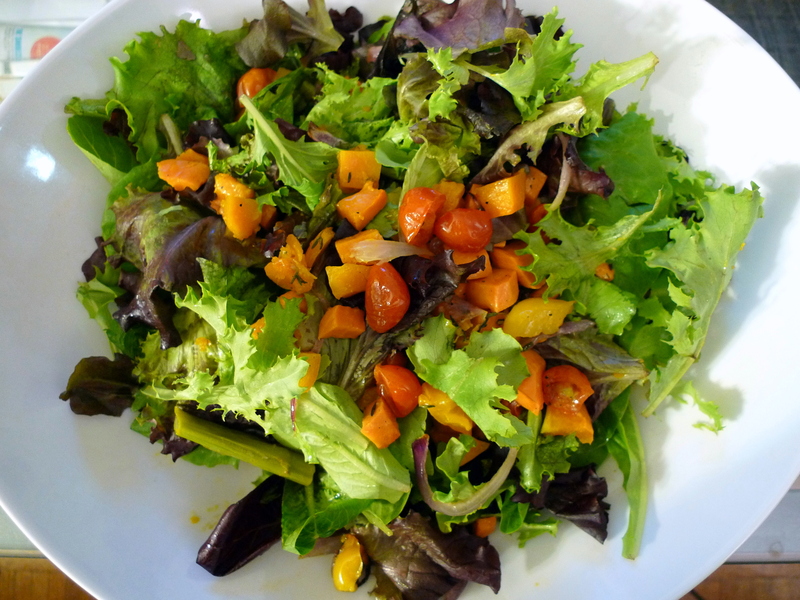 When the vegetables are warm (not hot), add the mesclun mix and toss. Sprinkle some lemon juice and season to taste. Enjoy immediately! Sounds delish, Can this salad be served cold?